The magnificent Sigma DG Macro Lens will help you easily capture high-quality, detailed, shots. It is optimized for use with digital SLR cameras and has a compact design that makes it easy to travel with. This high-end camera lens has a focal length ranging 70mm to 300mm and features a magnification ratio of 1:2 for close-up shots. The wide aperture range of F4-5.6 makes this camera lens perfectly capable of capturing pictures in any condition. This makes this high-performance Sigma camera lens the ideal choice for portraits, sports photography, and nature photography. The multi-layer coating on the lens reduces the effect of flare and ghosting, ensuring you of distortion-free images. If shooting close-up objects is your thing, then this Sigma macro lens will make an excellent pick. It features a focal length in the range from 70mm to 300mm that lets you shoot incredibly rich and detailed pictures in any condition, be it a beautiful landscape, street photography, or even telephoto it for wildlife. This camera lens has a very high magnification ratio of 1:2 for capturing close-up shots with exceptional detail and accuracy. 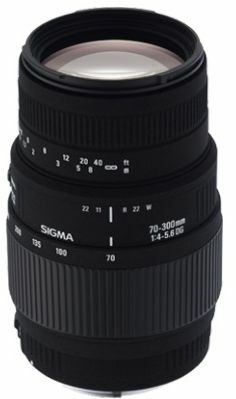 This Sigma lens will help you capture crisp and clear shots every time. It has a multi-layer lens coating the help reduce the effects of flare and ghosting, ensuring you of high-quality pictures every time. Explore your love of photography wherever you go with this splendid Sigma macro lens. It has a highly compact and lightweight design that makes it incredibly easy for you to carry with you on the go. All the more, this camera lens comes with lens hood, front and rear caps for your benefit. nice lens for distance portrait photography with a tripod.